BBC News Online covered the second day of counting in the Northern Ireland Assembly election as it happened. Read through our coverage of Saturday's events to see how a clearer picture of the next assembly began to emerge. 1830 The sun will soon set on day two of the NI Assembly election county. BBC NI's live election page is finishing for the day... It has been a long one, but all your tweets and emails helped keep the debate lively. 1827 Sinn Fein's Francie Molloy who had lodged an official complaint about the count in Mid Ulster said there was no reason why the process could not be "accurate and speedy". 1827 Will Leitch tweets "another hour or more before next Mid Ulster announcement. We can't even watch Dr Who." 1819 Mr Robinson also revealed that the most important department for the DUP to take in the new assembly is finance. When asked about the education portfolio, he said it was a "very high priority for us" but said he was not going to "allow other people to see our hand". 1818 When asked about Tom Elliott's comments, the DUP leader Peter Robinson said: "I'm pretty sure Tom is under pressure and we should give him a bit of latitude." 1817 Jim Allister, TUV, says: "I am going to Stormont to be a thorn in the flesh of the DUP Sinn Fein cabal." 1812 Mr Elliottt added that he was not going to forget what some members of Sinn Fein had previously done. 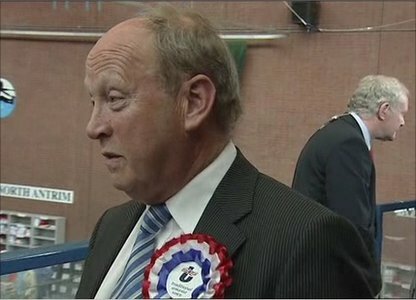 1809 UUP leader Tom Elliott refuses to withdraw the remarks he made at the Omagh count centre when asked by BBC Radio Ulster. 1805 Sinn Fein's Michelle Gildernew wonders if Tom Elliott had a "rush of blood to the head" with his outburst at the Omagh count centre. She described it as a "very unpleasant incident". 1800 MID ULSTER RESULT SDLP's Patsy McGlone elected in Mid Ulster. 1743 Norman in Belfast writes: "Maybe Tom Elliott and Jim Allister can form a new party together? 1740 Sinn Fein's successful Upper Bann candidate John O'Dowd says that Mr Elliott's comments were those of a "cornerboy" and that he lacked the skills to be a political leader. 1739 Aidan in Derry writes: "Nice to see Alliance getting more seats, truly an indication of a change in attitudes across Northern Ireland. Time for an end to green and orange politics." 1735 The UUP's Tom Elliott defends calling Sinn Fein supporters "scum" after they heckled him at the count centre in Omagh. 1727 More tweets - Mark McCloskey says "UUP needs new leader, Tom Elliot needs removed from the party. He must have thought, 'what can I do to make this election worse?'" Barry McGee says: "Amazing scenes in Omagh as Tom Elliot forgets that he leads the UUP, not the TUV"
1723 NORTH ANTRIM RESULTS The TUV's Jim Allister and UUP's Robin Swann elected in North Antrim. 1721 Martina Purdy tweets: "Gerry Kelly says Tom Elliott taking his party to the right with his reaction in Omagh to SF hecklers." 1718 STRANGFORD RESULTS The UUP's Mike Nesbitt and David McNarry elected in Strangford. 1715 Alexander Mason tweets: "Tom Elliott needs to go! ..and realise that these politicians have moved on and are helping to make this country a better place"
1713 Mark Glover tweets "Tom Elliot seems to have forgotten there is a peace process"
1706 Tom Elliott roundly booed at Omagh - calls Sinn Fein "scum"
1659 UUP leader Tom Elliott "pleased Ulster Unionist transfers helped get DUP 3rd seat for unionism in Fermanagh South"
1646 EAST BELFAST RESULT - Alliance's Judith Cochrane elected. 1645 NORTH ANTRIM RESULT: DUP's David McIlveen elected. 1640 Louise Cullen tweets: "Tommy Gallagher says not a sad day, family have stood by him and looking forward to spending time with them." FERMANAGH SOUTH TYRONE RESULTS: Sinn Fein's Phil Flanagan and Sean Lynch take the final two seats. EAST BELFAST RESULTS: Judith Cochrane is elected in East Belfast. WEST BELFAST RESULTS: Fra McCann, Sinn Fein, and Alex Atwood, SDLP, both reached quota and have been elected. Two seats left to be filled. EAST ANTRIM RESULT: Alastair Ross, DUP, is elected on fifth count. Steve Hollingsworth from Philadelphia, USA, writes: "I disagree completely on the issue of how fast the votes are counted. The real issue is trust, not feeding the insatiable paparazzi frenzy. Being able to tell your public that the results are definitely honest and completely verifiable is worth far more than two days' wait." BBC's Louise Cullen tweets: "DUP Maurice Morrow through at Stage 5 in Fermanagh South - got a congratulatory peck on the lips from colleague Arlene Foster." Gareth Gordon tweets "Jonathon Bell feeling 'blue'. Missing Irish Cup final for the count." 1558 NORTH BELFAST RESULT: William Humphrey, DUP, is elected. 1556 EAST LONDONDERRY RESULT: George Robinson, DUP, elected. 1543 BBC's Simon Hunter reports that Fred Cobain UUP has lost seat to DUP's Paula Bradley. 1537 BBC's Gareth Gordon says there are just 20 votes between Joe Boyle of the SDLP and the UUP's David McNarry for last seat in Strangford. 1528 LAGAN VALLEY RESULT: Paul Givan, DUP and Brenda Hale, DUP,are elected. Andrea Gribben from Holywood writes: To all parties, please now let's move forward and unify the people of Northern/the North of Ireland in prosperity, health & happiness, whilst respecting and celebrating our rich diversity of culture & tradition. 1509 BBC's Natasha Sayee tweets: "Ards Count centre's chilled-out atmosphere almost feels like everyone is resigned to a long day." 1504 EAST LONDONDERRY RESULT David McClarty, independent, and Adrian McQuillan, DUP, are elected. 1455 BBC's Julian Fowler says declaration in Tyrone interrupted his tea and carrot banana cupcake. Omagh canteen staff refuse to divulge recipe. 1428 Alliance's Anna Lo says she got votes from all sections of the community, which shows that "positive politics does pay here in Northern Ireland". 1415 BBC's Kevin Magee says North Belfast and East Antrim counts are moving "at a glacial pace". 1359 BBC's Rosy Billingham in Newtownards says the UUP have been told by the returning officer that the count for East Belfast could go on until midnight. More coffee please! Charlie McKeown from Belfast writes: The poor performance of the UUP has much to do with the leadership of Tom Elliot. The party has to recognise that their political base consists of moderate voters - they will lose political capital if they try to emulate the DUP/TUV. 1352 LAGAN VALLEY RESULT: Trevor Lunn, Alliance, is elected. Catch up on the latest with our special election roundups on BBC Radio Ulster from 1800-1830 BST and BBC1 from 1715-1814 BST. James in Belfast writes The SDLP need to realise that they're a working class nationalist party, their main problem is that instead of competing with Sinn Fein, they're going to find themselves competing with the Alliance Party. 1338 SOUTH BELFAST RESULT: Confirmation that three candidates have been elected without reaching the quota: Alex Maskey, SF; Jimmy Spratt, DUP, and Conal McDevitt, SDLP. 1333 SOUTH DOWN RESULT: John McCallister, UUP is elected on the sixth count. 1330 BBC's Rosy Billingham at East Belfast count, has been talking to Ulster Unionist Philip Robinson who got 943 first preference votes. He believes that when he is finally eliminated, 60% of his transfers will go to his UUP running mate Michael Copeland, which should get him the 6th seat ahead of independent Dawn Purvis. She isn't at the count. Her votes are still edging up, but slowly. 1326 WEST TYRONE RESULT: SF Barry McElduff and Pat Doherty confirmed. 1321 The BBC's Kevin Sharkey says Mary-Kate Quinn from Sinn Fein is about to be excluded from the Lagan Valley count, which will mean "no nationalist or republican representation in the constituency". 1319 The UUP's Michael McGimpsey says:"We will look at the lessons that need to be learned in South Belfast"
1315 SDLP's Pol Callaghan has been eliminated from the Foyle count. 1312 The UUP's Sandra Overend says: "looking at the figures this morning, I am confident I will take a seat in Mid Ulster". Andrew in Frankfurt, Germany writes: "I would like to see Anna Lo as culture minister, hopefully to put an end to the politicization of Irish and Ulster-Scots. A bit of Chinese culture wouldn't go amiss." 1259 Mr McGimpsey is asked whether the decision on the cancer centre in Altnagelvin affected his party's election prospects - he says there was no question of the unit being cancelled or deferred. However he says there was a lot of political capital made over the issue. 1256 Ulster Unionist Michael McGimpsey was elected on the fifth count. "It's not about topping polls" he tells Noel Thompson. 1252 TUV leader Jim Allister says he's confident he will take the fifth or sixth seat in North Antrim. 1251 The DUP's Arlene Foster says she's delighted that unionists have retained three seats in Fermanagh-South Tyrone. 1250 SOUTH BELFAST RESULT: The UUP's Michael McGimpsey has been elected. John Dunlop in Magherafelt writes: "Some of us work late into the night every day not just during an election. And we get our hands dirty too, for half your pay." 1245 BBC's Keiron Tourish says David McClarty says he's confident of taking a seat in East Londonderry. 1244 Sinn Fein's Cathal O hOisin elected in East Londonderry. Martina Purdy tweets: The latest is Jim Allister's fate still in balance - but a seat looking more likely than not. 1222 Sinn Fein's Martin McGuinness predicts party colleagues, Michelle O'Neill and Francie Molloy will be returned in Mid Ulster. He also says the party is in with a "real chance" of taking a fourth seat in the constituency at the next assembly elections. 1219 UUP deputy leader John McCallister who had been under pressure in South Down tells Noel Thompson he's confident enough he will retain his seat. @ciara_hackett tweets "Tell me I'm not the only one enjoying the fact the #ae11 count is taking this long? Next decent election is US - ages away!" 1212 Responding to criticism over the speed of counting, Graham Shields, chief electoral officer speaking from the Kings Hall, says STV counts last over two days. He says they have never previously completed an STV count in less than two days. "Yesterday, we were dealing with three electoral processes for the first time ever in NI," he adds. 1206 The BBC's Keiron Tourish says the SDLP's John Dallat is expected to be confirmed as elected in East Londonderry. 1203 The BBC's Nicola Weir says Jayne Dunlop from Alliance has been eliminated on the third count in North Antrim. 1200 Chief Election Officer Graham Shields says the law allowed for a recount in West Tyrone (see 1101). Mr Shields said at the end of the first stage of the count last night there were six votes separating two candidates. He says one of the candidateS made a formal request this morning. "Because we had not moved to next stage of count that request was granted," he says. 1158 LAGAN VALLEY RESULT: Jonathan Craig of the DUP elected on the fifth count. 1156 Nelson McCausland, elected for the DUP in North Belfast, says the party has polled extremely well there. He says the final seat on the unionist side will depend on Alliance transfers. The DUP's Paula Bradley will probably be up against Fred Cobain of the UUP for the final seat there. 1153Election analyst Fionnuala O'Connor says she believes that MPs who are not MLAs are increasingly isolated, as much as they have been since the downfall of the old Stormont parliament. 1152 The BBC's Martina Purdy says a senior DUP source is saying with confidence they'll get three seats in North Belfast - this would be a gain for DUP at the expense of the UUP. 1150 SOUTH DOWN RESULT: The DUP's Jim Wells elected on the third count. Dermot in Claudy writes: "Let the counters take their time for the correct result. God help us if we expected the same aggravated politicians to do anything for us in a short period. Leave the counting procedure alone." 1139 FOYLE RESULT: The SDLP's Mark H Durkan has been elected. 1138 The BBC's Kevin Sharkey says Conor Quinn from the Green Party has been excluded on the third count at Lagan Valley. The TUV's Lyle Rea also looks like being excluded. 1134 Alasdair McDonnell of the SDLP, speaking about why the public may have become disengaged with this assembly campaign, says he believes that 90% of all election literature goes straight into the bin. Liam in Belfast writes: "South Belfast very interesting. Where conceivably could Anna Lo's transfers go? McGimpsey to lose his seat? Could be the story of this election." 1130 The SDLP's Patsy McGlone says he's confident he will retain his seat in Mid Ulster. 1129 EAST BELFAST RESULT: DUP's Robin Newton elected on second count. 1128 Yvette Shapiro, reporting for the BBC from Ballymena, says there was an "incident" there last night involving verbal abuse between TUV and DUP supporters at a cafe in the Seven Towers Leisure Centre (see 1104 and 1112). The police intervened to calm tempers. She adds that there was an alleged assault during an incident between the two parties' supporters in Gracehill on Thursday night. 1126 Successful UUP South Antrim candidate Danny Kinahan says he listened in horror as he heard other parties talking about the Ulster Unionists demise. "We are not, we are there and we have got to get Stormont working," he says. 1125 Barry McElduff, Sinn Fein candidate in West Tyrone, says he has cancelled his participation in a 10k run in Gortin, in order to come back to the re-count at the Omagh Leisure Centre. 1124 The DUP's Ruth Patterson adds that she thinks the sixth seat in South Belfast will be a battle between the UUP's Michael McGimpsey and the SDLP's Conall McDevitt. She says both are "equally good candidates". 1120 The DUP's Ruth Patterson says she's hoping to be elected in South Belfast on the fifth count. 1120The SDLP's Alasdair McDonnell says the Executive is a "carve-up" between the DUP and Sinn Fein and the other parties are expected to be "nodding donkeys". 1116 The BBC's Claire Savage in North Down says the DUP's Gordon Dunne and Peter Weir have been elected. 1115 The BBC's Kevin Sharkey says no-one has been elected in the third count in South Down. Henry Reilly from UKIP has been excluded. 1112 The DUP's Ian Paisley says the trouble last night outside the Seven Towers Leisure Centre in Ballymena was nothing to do with the DUP or the North Antrim count. 1111 The BBC's Shane Harrison says questions have been raised over whether a recount will go ahead in South Down. 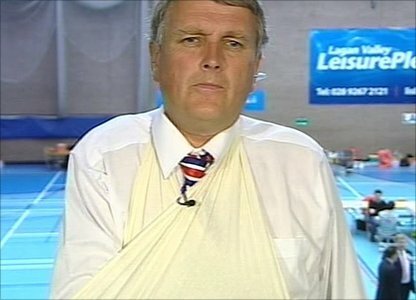 It has been a bruising contest, as the DUP's Jim Wells will attest. No fisticuffs though (see 1104) - he tripped and fell while taking down election posters. 1107 EAST ANTRIM RESULT: David Hilditch has been elected for the DUP. 1106 Patsy McGlone, who is hoping to be elected for the SDLP in Mid-Ulster, says the key issue in that constituency will be how Martin McGuinness' surplus transfers to the other Sinn Fein candidates. At the last election, it was three SF and one each for the SDLP, DUP, and UUP. 1103 BBC NI political editor Mark Devenport says Thomas Burns, who missed out on a seat for the SDLP in South Antrim, will be a sad loss for the Assembly football team for whom he starred during its sporadic appearances. 1102 New DUP MLA for South Antrim Pam Lewis says she is "over the moon" to be the party's third elected candidate in the constituency and hopes to see more women at Stormont when she arrives there in the coming days. 1101 RECOUNT: The BBC's Louise Cullen confirms a full recount of the West Tyrone result has been ordered by the deputy returning officer. 1055 The BBC's Nicola Weir says it looks as if the DUP vote transfer management has paid off in North Antrim. The TUV's Audrey Patterson has been eliminated. 1047 The BBC's Rosy Billingham says the make-up in East Belfast is predicted to be three DUP, two Alliance and one Ulster Unionist. 1046 A BBC producer says the SDLP is considering whether to ask for a full recount in South Down - the party is currently seeking legal advice. 1043 Alliance leader David Ford says the party's vote appears to be up in every constituency and predicts they may gain a few extra MLAs. 1033 The BBC's Keiron Tourish says unofficial SDLP sources say Mark H Durkan is close to being elected in Foyle. Paul Harvey in Belfast writes: "If politicians and voters want quicker results, surely it is time to consider some form of electronic voting or the use of optical character readers to record and calculate results." 1029 The DUP's Arlene Foster says it looks like Tommy Gallagher of the SDLP will lose his seat in Fermanagh-South Tyrone to Sinn Fein. 1028 Ulster Unionist Danny Kennedy tells the BBC's Noel Thompson that the election isn't over yet and a relatively small handful of votes would have a significant impact on the end results. He says the party "got out of jail" in Upper Bann. In the seventh round his colleagues Jo-Anne Dobson and Sam Gardiner were elected below quota, as was the SDLP's Dolores Kelly. 1024 "A good election for the big hitters," says political commentator Austin Hunter. @bbcmarkd tweets: "As Upper Bann proved to me, last seats are hard to call - but right now I think pecking order at Stormont may stay same." 1021 The UUP's Ross Hussey says the recount in West Tyrone has begun. @bbcmarkd tweets: "Will independent unionist David McClarty rejoin the UUP fold? Could prove crucial if UUP ends up with exactly twice as many MLAs as Alliance. Under D'Hondt that would create a "dead heat" for ministerial department - tie breaker is parties' first preference votes"
1017The BBC's Keiron Tourish in Lisneal College for the Foyle and East Londonderry counts says counting has resumed. 1014 SOUTH ANTRIM RESULT: Ulster Unionist Danny Kinahan elected. 1011 The BBC's Martina Purdy says Sinn Fein is expected to get five out of six seats in West Belfast. The UUP concedes it has no hope of a unionist victory there. 1008 The BBC's Yvette Shapiro in Ballymena says she was told by a member of count staff that they were there "not for a good time but for a long time". 1005 As we await the first result after counting resumed, the current state of play is the DUP are on 18 seats, Sinn Fein have 15, UUP have five, SDLP four and Alliance three. Tom Moore in Coleraine emails: "Politicians complain about slow counts. What about their torturous negotiations over the years?" 0955 The BBC's Chris Page says the SDLP's Thomas Burns, who looks likely to lose his seat in South Antrim, has not arrived at the count centre. 0952 We covered all the results and reaction on Friday, but a few results came in overnight. In Newry and Armagh, Sinn Fein's Conor Murphy topped the poll. Dominic Bradley of the SDLP and Ulster Unionist Danny Kennedy were also elected in the first round. Sinn Fein's Cathal Boylan, the DUP's William Irwin and Sinn Fein's Mickey Brady retained their seats. 0944 The BBC's Nicola Weir says counting has just resumed in North Antrim. We're still waiting on three out of six seats there. All eyes are on TUV leader Jim Allister. 0939 The BBC's Martina Purdy says politicians have been more forgiving than the punters about the delayed results. 0937 The BBC's Louise Cullen says there's been a formal request for a recount in West Tyrone. 0926 Chief Electoral Officer Graham Shields defended the process, saying it's "about accuracy, not about speed". He added: "This is a complicated process and people have to accept that. We will take as long as it takes to get it right." 0924 By way of comparison, Scotland counted through the night and the first result was in at 0054 - the final result came in at 1721 BST on Friday. In Wales, some constituencies counted through the night. The first result emerged at 0210, and all results were in by 1350 BST. 0923 One of the big stories from Friday was criticism of the speed of counting. The first result came in at 1900 BST, nine hours after counting began and 21 hours after polls closed. 0918 Trends suggest a strong showing for the DUP, Sinn Fein and Alliance, but the overall outcome is less certain for the Ulster Unionists and SDLP. Counting is under way at centres across Northern Ireland. 0909 Good morning and welcome to day two of our live results page. It's a bleary-eyed start after a late night of counting, and many candidates will have spent a sleepless night as they await news of whether they have been elected. So far, two-thirds of seats are still to be filled.